Flashback to Sean visiting his parents with his girlfriend and new baby Emma and being relieved to be called back to Carickfergus to investigate the murder of a small time drug dealer. From the start his investigation is hampered by poor process and with everyone intent on seeing it put to bed. But this is Sean’s first murder case in a year and, as familiar readers will know, even if his superiors do not, Sean does not like a mystery going unsolved no matter where it leads him. In this case the clues do not lead far or fast but slowly build up broader suspicions, finding connections that go deeper than first appearances. And with the involvement, once again of the secret service and IRA, Sean finds himself in the crosshairs. Police at the Station… continues to be the best of crime fiction. 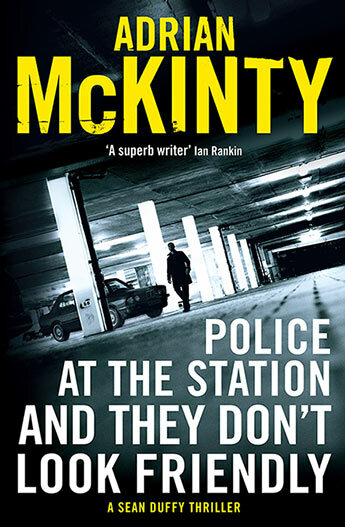 McKinty uses the genre to effectively open a window into a time and place, using the mystery and Duffy’s travails to further illuminate the history that he is so effectively conveying. Police at the Station… may be the sixth in the series and can at a pinch be read as a stand-alone. But if you haven’t caught up with Sean Duffy yet, do yourself a favour and go back to the beginning.